Only 10% of the break even figure has been sold. I am getting tired of trying, and have no belief that I will sell enough. Years ago had the idea for a Priestley festival combining the birthday show for Priestley and me on the 13th Sept. that I had been doing already; and a separate event combining a film screening of Lost City and a bus tour around Bradford things shown in that film. This year things seemed to have clicked. The last bus trip I helped organised had massive praise; Pictureville agreed to a screening; and Napoleons agreed to host the show. Napoleons have been great. They could not have been more professional; and if I just concentrated on selling tickets for that my life would have been easy these last few weeks. The screening did get a bit fraught; but it got sorted. However they are not mentioning the bus trip, and were never going to; so it’s only me advertising it. So the selling was down to me. I have had a few good friends helping with stuff, but I am the only one selling; including writing articles in 2 magazines and one paper (only one of which had my name on but I am happy for that). The bus company offered to take a very late cancellation rather than me cancel it last week. In the week since I had the newspaper article appear; and sold 2 more tickets. I also discovered friends I was relying had created a big event on 13th September. They did not do it to hurt me, but I have been banging on about me doing a show on my birthday for at least 4 months. Nothing I said; no leaflet I gave them; no poster I put up in their place made them remember I had a show on the 13th Sept.
People remember me; but I cannot sell them stuff; or get them to remember what I am actually selling. As I say on the http://www.bradwan.com post. The Lost City film will be shown. I can concentrate on the Napoleons show, and feel better for no longer having to flog a dead bus trip on my own. I cannot but feel sad though that a really good idea will never happen. Oh look! 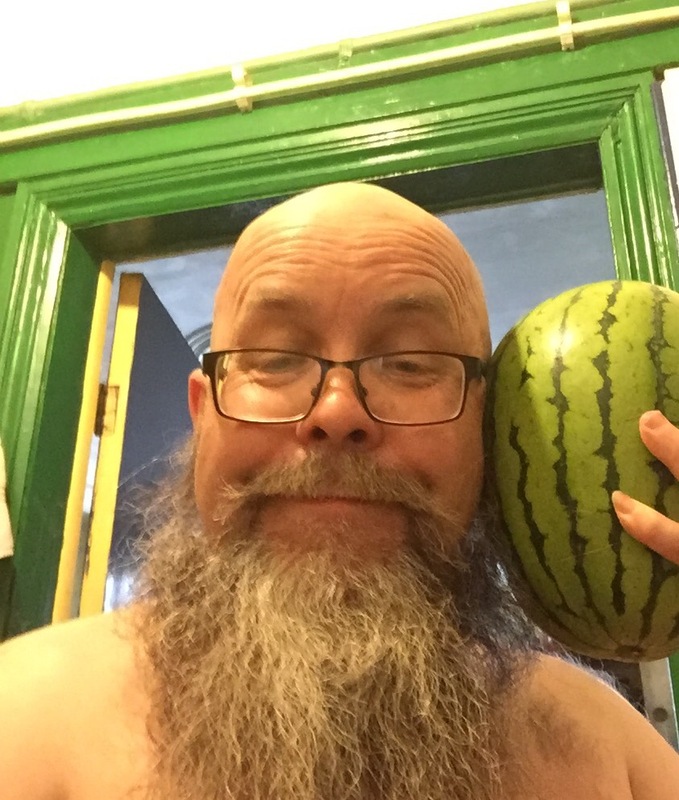 I’ve found a watermelon smaller than my head! Today has been a very positive day. Sunday was also a grand few hours in Brighouse. But 3 out of the last 5 days have be proper shite, and I didn’t; even see us lose to Blackburn Rovers on Saturday (I were angry and pissed off enough at 13.00 on Saturday, after an hour’s drinking, to not want to be made more so by Bradford City). 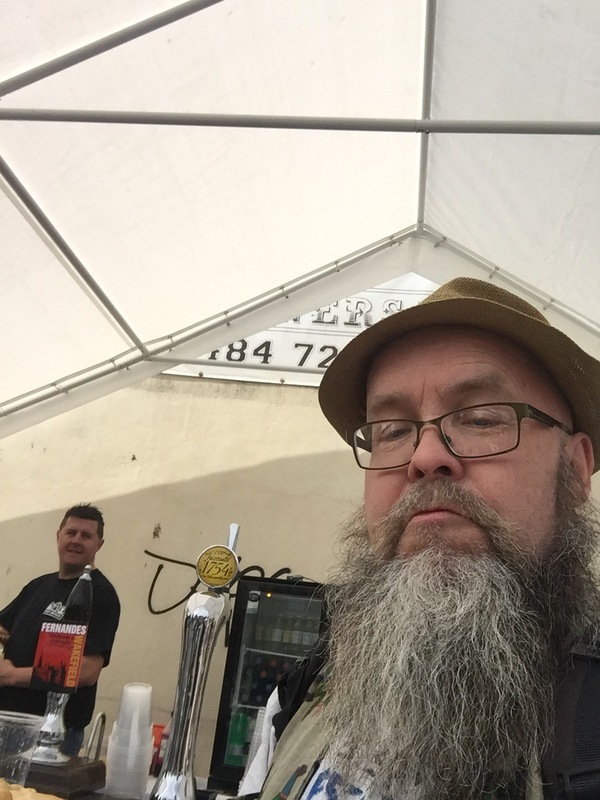 Garath helped make Brighouse Summer Fest. I actually remember this 1963 hit in Japanese. I doubt I remember it from being 3 years old, I have only the vaguest memory of my dad listening to a valve radio in the time before our first television, which arrived no earlier than 64. After that I remember a Phillips transistor radio I was given around 67. I got an e-mail this morning changing terms and conditions of something I have organised, and blithely asking if that was OK. I went out to the Sparrow to moan, and ask advice. I moaned at everyone I knew, including Methodist Graham, Pump Clip Dave, and the Sparrow Steadfast. By the time I left I’d sorted out a fair and reasonable way to respond to the demand for change. The truth is I do not need to try and create stuff. It is good for me, but if I just spent my time drinking in pubs I would not lose much. If I just walked to Lidl to buy the cheapest alcohol and stayed home drinking it, that would not be so healthy. Yet another discovery. The Vision On music! Al Hirt, Java. Another discovery: Eric Burden & War. Spill The Wine. From the days when the USA was the best country for talents from across the world to meet and create.